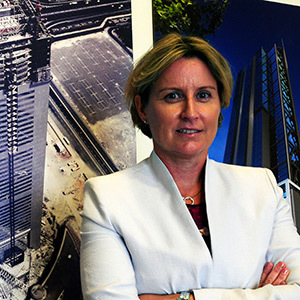 Sharon Warburton began her career as a numbers person and now the 2014 Western Australia Telstra Businesswoman of the Year is riding high as head of strategy and finance at Brookfield Multiplex, overseeing its portfolio of construction projects, and a board member at Fortescue Metals Group. Born and raised in the northwest of Western Australia, Sharon Warburton was no stranger to the mining industry growing up. After becoming a chartered accountant, Warburton joined Hamersley Iron (now part of Rio Tinto) in the mid-1990s, a “bold move” for a young female number cruncher at that time. She started in tax, then moved into finance and then hopped from location to location with the company, which gave her the experience and insight to move into the strategy division. The complementary nature of mining and construction then saw her skills readily transfer into a role at Brookfield Multiplex, one of Australia’s largest construction companies. “I have the luxury of having senior roles in both the construction and mining industries,” Warburton affirms, referring to her position as head of strategy and finance at Brookfield Multiplex and her seat on the board at Fortescue Metals. The jump didn’t happen in a vacuum, however. Warburton says her skills and knowledge were enhanced through “the power of relationships” rather than formal education. “I didn’t go off and do a masters in construction management, yet I understand more than enough about how construction and mining works to be able to have leadership roles in those industries. There were a couple of gentlemen who became my sponsors. I taught them how to think commercially and financially; they taught me about the business operations and the art of mining or the art of construction,” she explains. Warburton wears two executive-level hats for Brookfield Multiplex—one for strategy and one for finance—where she rarely has two days the same. “The easiest part of that is the finance, where I lead a team that is responsible for providing all the financial support to the projects and the business, and all of the corporate financial reporting,” she says. One myth Warburton would like to dispel is that construction is not a place for women, that females can’t have great careers and succeed in a construction environment. “You can have a very, very successful career and you can have a very fulfilling one in a very safe and respectful environment,” she declares. Part of her mission is to be visible, not just as a role model but also as an advocate of alternative career pathways for women in the industry and alternative ways of working, a position she forged when she had her daughter. As a result she is now a mentor to more than 50 protégés around the world and regularly speaks to young people about her journey. “The assumption is ‘this is the path and you must be on this path’. We need to dispel that myth and give females the confidence to create paths and identify paths that work not only for them but also for organisations. Warburton’s strategic thinking has enabled her to fashion a generation of future leaders that will be as diverse as the work styles she wants them to support. While it seems crazy to take on dozens of protégés, her thinking is sound. “By putting extra energy into the emerging generation, I can learn from the experiences that I and others have gone through in the previous generation and that will inspire them and give them confidence to create different cultures and leadership styles in the future,” she reasons. The 2014 National Telstra Businesswoman of the Year will be announced on Wednesday 26 November 2014 at a gala dinner in Melbourne.